I’d rather stand on my head than buy unhealthy munchies while I’m out with the kids, so I’m always on the lookout for pack-able snacks I can make at home. 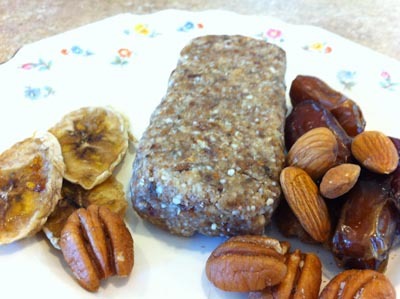 When we discovered the idea of making simple 3 to 5 ingredient Larabars at home, we had a hay day coming up with new flavors and experimenting with superfood bars for travel. 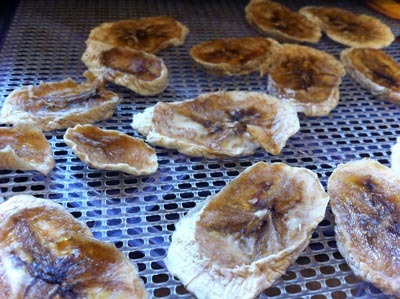 This banana version requires the additional step of dehydrating the bananas, but that part is really easy. Even without a dehydrator. The dehydrated bananas in this recipe need to be flexible, chewy bananas that you’ve made at home, NOT store bought banana chips. Either use a dehydrator or lay a sliced banana out on a greased cookie sheet and dry in the oven at 175 degrees for 2-3 hours or until dry like a raisin. *Update* These instructions for making dehydrated bananas in the oven are very good. 1. Grind all the nuts to a coarse powder. I use my VitaMix for this step, but you could also use a food processor fitted with an ‘S’ blade, a nut mill, or powerful blender. Transfer the ground nuts to a bowl and set it aside. 2. Put the dried fruit into VitaMix and turn it on. In my machine, the dried fruit looks like it’s just getting thrown around by the blades, but it really is getting cut. Process it for about 30 seconds. 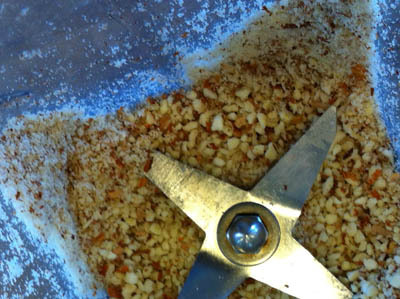 It will become more finely ground when you add the nuts. 3. Now add the ground nut mixture to the dried fruit in the VitaMix and turn on the blades. You’ll need to use the tamper to push the mixture down into the blades and keep it moving. Keep it running until you can see that the fruit is getting sticky and combining with the nut meal. 4. Transfer the mixture to a bowl and press it into bars with your hands. Wrap in waxed paper or parchment paper. These can be kept at room temperature for a few days or in the fridge for a few weeks. 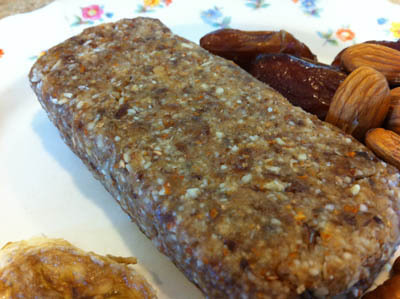 Each recipe makes about 4 bars, 1.5″ by 3.5″.